The Icare HOME (TA022) is one of two new tonometers from Icare Finland Oy. It could be regarded as an evolution of the now discontinued Icare ONE(TA02). The other new model is the ic100 which is generally not suited for personal use. Both tonometers operate on the patented rebound principle and are quite similar in appearance and operation even sharing the same outside enclosure design. They are aimed at health care professionals and include a system and business model of loaning or renting tonometers to their patients and form part of an integrated system including the Icare PRO and Icare Link Software. The Icare HOME is very clearly aimed at and part of this model. Specifically the ONE provides an indicative IOP range during measurement. The new HOME on the other hand provides no indication with health care professionals downloading measurements during clinic visits onto the Icare Link software platform. IOP is not visible to the patient on the HOME and requires the Link software in PRO mode to view IOP as per the latest version (1.81). PRO mode software is only available to health care professionals. Graduated supports for forehead and cheek alignment adjustment. Automatic identification of the eye being measured by IR reflectance off nose. System of LEDS to provide user feedback in terms of attitude, alignment and error situations. New measure button that can provide either a single measurement, a series of six measurements automatically or a combination. The HOME feels more substantial and solid than the ONE although the physical size is the same. It is priced @50% premium over the discontinued ONE (depending on market). The same probes are used by each tonometer. Probe bases are different due to the LED alignment system on the HOME. My view is that technically the HOME is the superior tonometer with clearly a lot of effort going into addressing some of the ONE’s shortcomings. 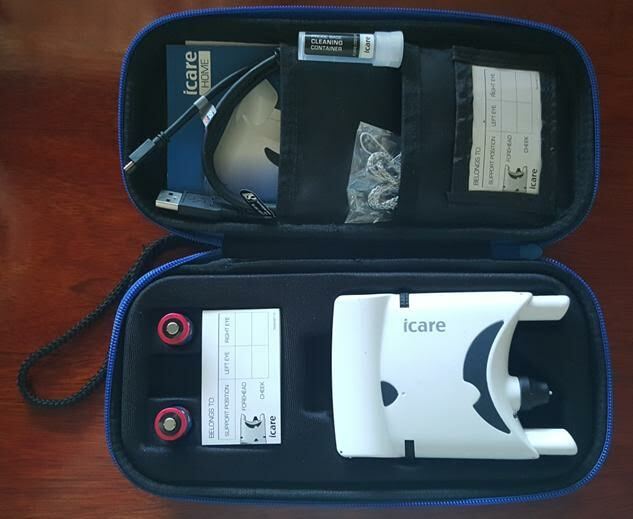 The Icare HOME is certainly suited for personal IOP monitoring by many if not most glaucoma patients and is one of the few tonometers that are suitable for this activity. The major concern is that it does not provide even an indication of IOP at the time of measurement. As such it lacks immediate positive feedback. Whether or not the additional features justify the @50% price premium is another question. First impressions were favourable. The carrying case was much higher quality than the ONE with dedicated moulded compartments for the tonometer and various accessories. The HOME tonometer itself felt somewhat higher quality than the ONE. The only real issue is that it still uses the same design of battery cover as the ONE which has caused me some problems in the past. Package contents include the tonometer, 10 probes, batteries, USB cable, base cleaning tube, hand strap, patient settings tear off cards, manuals and software on a USB drive. Setup is straightforward. Install the batteries then adjust the forehead and cheek supports. In terms of the support adjustment this is the same as the ONE however it has marked graduations so that the original position can be found if the adjustment thumb wheels are knocked out of alignment. This is a common occurrence with the ONE and I would think also the HOME as the design is very similar. Adjust the forehead and cheek supports out farther than they need to be. 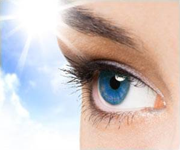 Looking straight ahead place on your face and adjust one of the supports so that the tonometer is horizontal. Remove from face Insert a probe and position back on your face. Adjust both supports in unison so that the probe is 4-6mm from your eye and the tonometer is horizontal. Optional: Subsequently to the first few first few measures I typically end up moving it in until the tonometer errors on measures and then move back out a bit at a time until it takes measures error free. This puts it in the lower distance. If you try this please don’t poke yourself in the eye. That’s it the HOME is now ready to take measures. The first thing that struck me was how bright the LED’s were. States are solid green, solid red or flashing red. 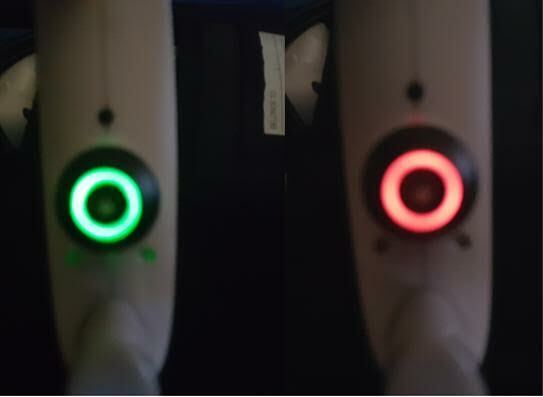 Indication as to how bright LED’s are. The first measures were somewhat interesting. Bizarrely it was both easier and more difficult to take a measure with the HOME compared to the ONE. My technique with the ONE is to make sure that there is a light source (window, sun, light bulb) behind and off a bit of the shoulder on the same side as the eye being measured. The probe tip and probe base are quite visible and you adjust to make it all concentric. Then take a first measure and watch the probe shaft shadow. Adjust as necessary. The problem is the HOME LEDs are so bright there are no visible shadows from the probe shaft and compounding this the probe base is black rather than the white that the ONE has. However the white probe tip is visible against the centre black (you can just see the probe in the picture above, I did say the LEDs are bright). However it is quite easy to ensure that it is concentric due to the LEDs. Consequently the first measures were of poor quality and highly variable. They improved markedly with practise and observing the probe tip however after several hundred measures over 5 days I unable to match the quality of measurements from the ONE. I have used the ONE since 2012 so am quite proficient with it and believe that with more practise this situation with the HOME will improve. One unexpected advantage of the LED’s is that measures can be taken without a light source or even in the dark. This is a big plus for me. The ONE takes a single measure at a time requiring the operator to press the measurement button six times. There is the ability to use a pin to press a button so that it enters a mode where six measurements are taken automatically with a single press of the button. Theses six measurements are averaged to provide a final single measurement. The HOME is different in this regard. You can press the measurement button once per measure or just hold it down and it takes six measurements in a row. However you can also run a variation of this. Press the button once or more which allows you to check alignment, adjust it and then hold the button down and it will take the remaining measures. This is a nice feature and an improvement over the ONE’s system. The six measurements are also averaged by the HOME for the single final measure. The HOME automatically identifies which eye is being measured and as such there is no requirement to measure in specific sequences or write measurement orders down. This is quite a nice feature although plenty of people, myself included, have no real issue regarding this with the ONE. In my view the Icare HOME is a good portable tonometer suitable for personal use. I like this tonometer a lot. It certainly is a big improvement for its intended health care loan market as the ONE had quite a learning curve which would be problematic for short term loans. The lack of reliable eye identification would also have been a factor. These are non issues for long term patients whom own an Icare. The big problem is that the Icare HOME provides no indication of IOP at the time of measurement. This means that there is real time positive feedback. There are ways to work around this however it is disappointing to find that workarounds are required. Disclaimer: I use the Icare as a portable adjunct to a Reichert fixed tonometer to ensure that deficiencies in technique does not lead to poor measurements from the Icare.